Announcement NOW OFFERING FREE SHIPPING IN THE CONTINENTAL UNITED STATES. We are the designers of one of a kind, handcrafted jewelry made with high quality gemstones. Specializing in semi precious stones and sterling silver with some gold fill designs. We welcome custom orders!! If you don't see something in our shop, or are looking for a specific stone, please let us know. We have access to many semi precious gemstones and may be able to accommodate your request. NOW OFFERING FREE SHIPPING IN THE CONTINENTAL UNITED STATES. The bracelet arrived promptly and was everything promised. The lapis is a beautiful blue and the bracelet is beautiful. Thank you! I bought these as a gift for my daughter for Christmas, I am sure she will love them! Such a beautiful necklace. The shipping was fast too. Beautiful kambaba jasper necklace for her!! 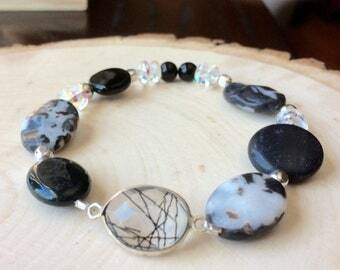 New gemstone bracelet to add to your jewelry box. Trendy and versatile. 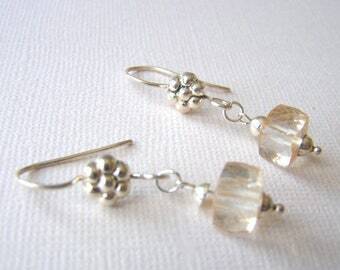 Beautiful aquamarine starfish earrings make a great birthday gift for her! Finished pieces. Earrings and necklaces. Looking for Herkimer Diamonds at the mine in the heat of summer. A daunting task but well worth the effort! Our earrings were worn by Maria, on the May 5, 2014 episode of The Vampire Diaries. Pretty proud! When Bill and I first met, his love of nature was apparent. He brought me along on hikes and introduced me to some local semi precious gemstones, such as garnet which can be found in the Adirondack Mountains of NY State. My love of anything "blingy" brought our two loves together, resulting in our shop "JemsbyJB&Company". We have been designing and making jewelry six plus years now. Over the years we have met many wonderful people, traveled to other areas of the United States to mine for raw stones and enjoyed all that this venture has to offer. We have grown from a small shop, frequenting local craft shows, to a shop that is featured both online and in local artistic venues. Our jewelry has been worn on "The Vampire Diaries" We have also participated in the gifting suites at several Golden Globe events and provided our jewelry to various stylists of other well known television shows for consideration of use on their shows. As we learn new techniques and investigate future vacation spots, which always include the possibility of new discoveries, our love of nature and creative spirit continues to fluorish.